“Goofy, outgoing, funny, nice, great person to be around.” That’s how Darington Hobson-College of Eastern Utah’s Point Guard/Shooting Guard/Small Forward on the Men’s Basketball team-wants those reading this article to know him. Darington comes from “Las Vegas, baby!” where he attended Western High School. At the age of 15 Darington moved to Texas with his mom, and finished high school at Gulf Shores Academy. 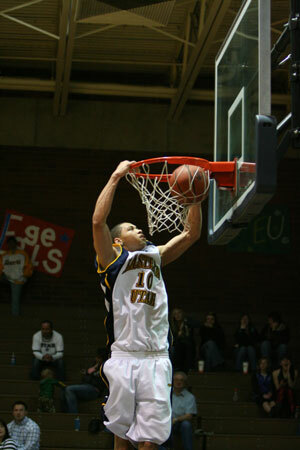 There that he played with team mate Gerald Green, who went on to play in the NBA. Hobson then went to Decatur Prep. His coach at the time, Alan Huss, is friends with CEU Head Coach Chris Craig. Trusting Huss’ word, and the testimonail of his cousin Leon Sutton, a current CEU student and basketball player, he decided to come play for Craig. After Darington had his first glimpse of Price, however, he momentarily rethought his decision. The exact thought that went through his mind was, “Wow, is this where I’m going to live for the next eight months?” It was a little different at first, but he adjusted and made many friends and had great experiences on campus. His favorite classes are English 1010 with Carrie Icard, group communication with Pam Cha, and intro to criminal justice with Scott Henrie. When it comes to food, Darington enjoys eating out at Olive Garden “the #1 place in America”, where he orders his favorite main dish, lasagna. Mint ice cream is his favorite dessert. Peanut butter M&M’s is his choice for a candy fix. “Hoop Dreams” is his favorite movie, which he enjoys watching when hanging out with friends. Darington considers Mt. Zion Christian Academy the hardest team he’s ever played against. Since then, he has played against many different teams and in his most recent game against the College of Southern Idaho – 1st in the nation – he scored a grand total of 83 points in two nights. Taking a trip down memory lane, Darington named the following events as the top three most significant to him; When he passed the ACT, his first phone call from scouts at the University of Texas interested in recruiting him, and when he signed his letter of intent to play at the University of New Mexico. Hobson will be graduating in December. “When I leave CEU, I want to leave behind a legacy of being the greatest player ever to step foot on campus,” a confident Darington states. He will then be attending the UNM on a full-basketball scholarship. He will study there for one to two years, then plans to enter the NBA draft.